U.S. Transportation Secretary Elaine Chao in two public appearances this week said that President Donald Trump will release a set of “principles” for his $1 trillion infrastructure investment plan by the end of May, with the detailed proposal provided by the third quarter of the year. She said that 16 federal agencies are developing the package, which not only includes roads, bridges, transit, airports and other “usual” infrastructure pieces, but also broadband, water and wastewater projects, and possibly hospitals for military veterans. The proposal is expected to use federal funding as an “incentive” to leverage public-private partnerships and other investments in order to reach Trump’s $1 trillion worth of work. “We are not only working to revitalize our country’s infrastructure, but we need to look for ways to revitalize our country’s workforce as well,” she told an audience at the U.S. Chamber of Commerce, where she made opening remarks for the Fifth Annual Infrastructure Week, May 15-19. In May 17 testimony before the Senate Environment and Public Works Committee, Chao said the administration will keep existing funding formulas in place as it continues efforts to streamline the permit-approval process and other policy reforms to help speed project delivery. Ranking Member Tom Carper (D-Del.) asked Chao about federal revenue for transportation investment. She said the “integrity” of the Highway Trust Fund is “very important” to the administration. “The good news is that nothing is off the table,” she said. Sen. Jim Inhofe (R-Okla.), former chairman of the committee, said that indexing or an “escalation clause” for the federal gas tax is something “that very likely is going to get looked at” as the Senate considers its own infrastructure bill. Several senators expressed concern about the Trump administration’s proposed elimination to the Obama-era Transportation Investment Generating Economic Recovery (TIGER) grants in its March budget proposal. Carper said the TIGER grant program can help leverage other investments, and Sen. Mike Rounds (R-S.D.) noted they also fuel economic development. The Trump administration is expected to release a detailed FY 2018 transportation budget on May 23. 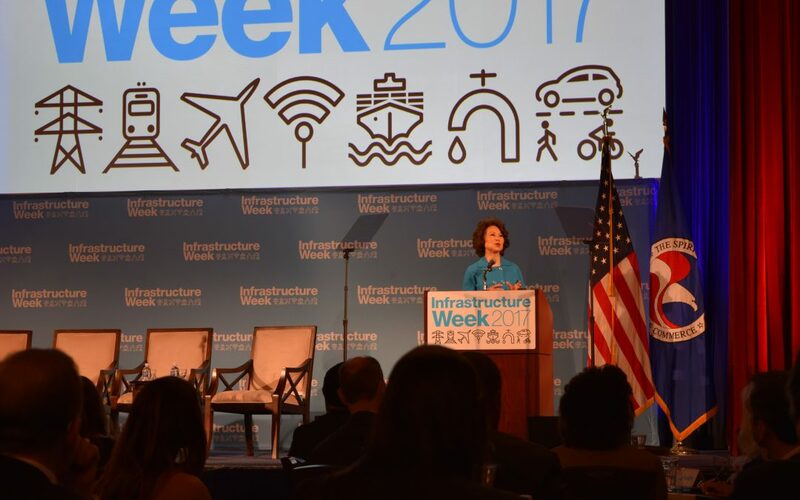 The importance of infrastructure to the U.S. economy, job creation and security is the focus of Infrastructure Week. About 100 events are being held in the Nation’s Capital and across the country.